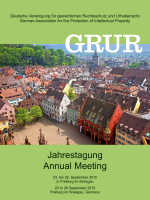 The GRUR Regional Group South West and the Mannheim Working Group of GRUR cordially invite you to take part in the GRUR Annual Meeting in Freiburg from 23 to 26 September 2015. Please find the programme brochure attached. At this year´s meeting, high-level speakers from academia, private practice and institutions such as the European Patent Office, the German Federal Court of Justice and the Swiss Federal Patent Court will debate the latest developments in European, German and Swiss IP law, with a particular focus on patent law, and share their visions on upcoming topics with you. We will also give you an overview on new developments at WIPO and the OHIM, discuss current activities at EU level impacting IP issues, such as the Digital Single Market Strategy for Europe, and offer you insights into the latest reports of the German Group of AIPPI. Alongside the working programme, you will enjoy a rich social programme in and around Freiburg, a venerable university town with a rich architectural heritage, picturesquely situated on the edge of the black forest, at the 'three-countries-corner' where Switzerland, Germany and France meet. Register now and join the German IP community for an enlightening and inspiring meeting in Freiburg! Please note that there has been a slight change to the programme of the GRUR Annual Meeting 2015 on Thursday, 24 September and Friday, 25 September 2015. The President of the European Patent Office, Benoît Battistelli, is unfortunately unable to attend the meeting on Friday, 25 September 2015 in order to speak about “New Developments in the European Patent System” at the “European focus”. However, we are pleased to announce that Raimund Lutz, Vice-President of the European Patent Office, has agreed to stand in for Mr Battistelli. We have also been informed by Brussels that Anne-Catherine Lorrain, Policy Advisor to MEP Julia Reda on copyright matters, will present a keynote speech on “Revising European Copyright Law: Facts and Fiction” at the meeting of the Committee on Copyright and Publishing Law concerning IP rights within a digital single market strategy for Europe, planned for Thursday, 24 September 2015.